The explanation for the upward steps for the most part has been overlooked…or the explanation might have been purposely ignored by the climate-science industry, because the financial foundation of their livelihoods is human-induced global warming not naturally occurring global warming. When you see how simple the explanation is for those naturally caused upward steps, you might conclude that the climate-science industry has, in fact, purposely ignored Mother Nature’s handiwork and willfully misled the public about the cause of global warming. In the preceding paragraph, I wrote the explanation for the most part has been ignored. The only place I know that it wasn’t ignored is in my ebook Dad, Why Are You A Global Warming Denier?, which was first published about a year ago. Now, it’s being discussed once again in this post. Note: For this discussion, we’re using one of the classic definitions of an El Niño event, where Eastern Equatorial sea surfaces temperatures in the tropical Pacific rise above a threshold due to coupled ocean-atmosphere processes (described later in this post) and stay elevated for more than a couple of months. In other words, this is not a discussion of a different type of El Niño, like El Niño Modoki. More specifically, I use a typical definition of an El Niño event, as reflected in the sea surface temperature anomalies of the NINO3.4 region of the eastern equatorial Pacific. That is, El Niño conditions are said to exist when NINO3.4 sea surface temperature anomalies meet or exceed +0.5 deg C.
The upward steps do not happen in response to all El Niño events. The upward steps shown in Figure 1 occurred in response to the 1986/87/88, the 1997/98, the 2009/10, and the 2014/15/16 El Nino events. They are most likely to occur during strong East Pacific El Nino events that are not opposed by volcanic eruptions. That is, the aerosols emitted by the 1982 eruption of El Chichon counteracted the aftereffects of the 1982/83 El Niño, which was comparable in strength to the 1997/98 “super” El Niño, and the aerosols emitted by the 1991 eruption of Mount Pinatubo overwhelmed any aftereffects from the 1991/92 El Niño. 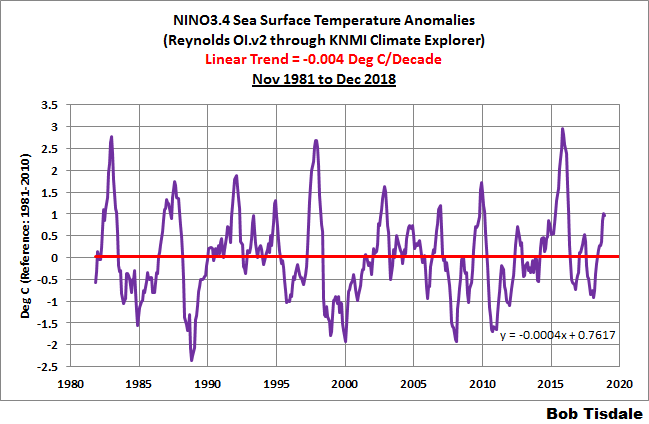 For the 1986/87/88 El Niño, NINO3.4 sea surface temperature anomalies reached or exceeded +0.5 C in September 1986, peaked at +1.7 deg C in September and October 1987, and remained above or equal to +0.5 deg C through January 1988. For the 1997/98 El Niño, NINO3.4 sea surface temperature anomalies reached or exceeded +0.5 C in May 1997, peaked at +2.7 deg C in November and December 1997, and remained above or equal to +0.5 deg C through May 1998. For the 2009/10 El Niño, NINO3.4 sea surface temperature anomalies reached or exceeded +0.5 C in June 2009, peaked at +1.7 deg C in December 2009 and remained above or equal to +0.5 deg C through April 2010. For the 2014/15/16 El Niño, NINO3.4 sea surface temperature anomalies reached or exceeded +0.5 C in October 2014, peaked at +3.0 deg C in November 2015 and remained above or equal to +0.5 deg C through April 2016. All four El Niño events peaked at, at least, a NINO3.4 sea surface temperature anomaly of +1.7 deg C, and the NINO3.4 sea surface temperature anomalies remained at or above +0.5 Deg C for a minimum of 11 months. First, you have to consider that the tropical Pacific and the ocean gyres in the North and South Pacific are acting as a natural heating system, with the tropical Pacific acting as the boiler and parts of the Pacific gyres outside of the tropics acting as the heating coils and baseboard radiation. That is, in the tropics (the boiler), the ocean surface waters are warmed by the sun as they travel from the Americas in the east to Australia and Indonesia in the west. As those sunlight-warmed waters travel around the rest of the circuits of the North and South Pacific gyres (the heating coils and baseboard radiation), they release the heat gained in the tropics to the atmosphere, primarily through evaporation. The aftereffects of strong East-Pacific El Niño events are comparable to sending a good amount of the water in a hot-water heating system back through the boiler a second time, with a bypass circuit, before the twice-boiler-heated water is sent out to the heating coils and baseboard radiation. That is, the water is sent back through the boiler another time before it has made its circuit of the rest of the heating system. What? you say. Yup, it’s that simple…so simple that even a child can understand it. Of course, a strong East Pacific El Niño event causes a long-term rise in global surface temperatures. There’s no way it could not. I’ll provide a more-detailed explanation later in this post, along with an explanation of how La Niña events are NOT the opposite of El Niño events. Occasionally during his Daily Updates and Saturday Summaries at Weather Bell Analytics, which I watch daily, and while displaying a graph of global Lower Troposphere Temperature (TLT) anomalies (Figure 2), Joe Bastardi refers to the obvious El Niño-caused upward shift in the global lower troposphere temperature anomalies caused by the 1997/1998 “super” El Niño. He then suggests that another upward step may have been caused by the 2014/15/16 El Niño. The source of the graph in Figure 2 is the Global Temperature Report from the Earth System Science Center at the University of Alabama in Huntsville, specifically the webpage here. The El Niño-caused upward steps in sea surface temperatures were first illustrated and discussed way back in January 2009 in my two-part post Can El Niño Events Explain All of the Global Warming Since 1976 (Part 1 at WattsUpWithThat is here, with the cross post of Part 1 at my blog here, and Part 2 at WattsUpWithThat is here, with the cross post of Part 2 at my blog here.) 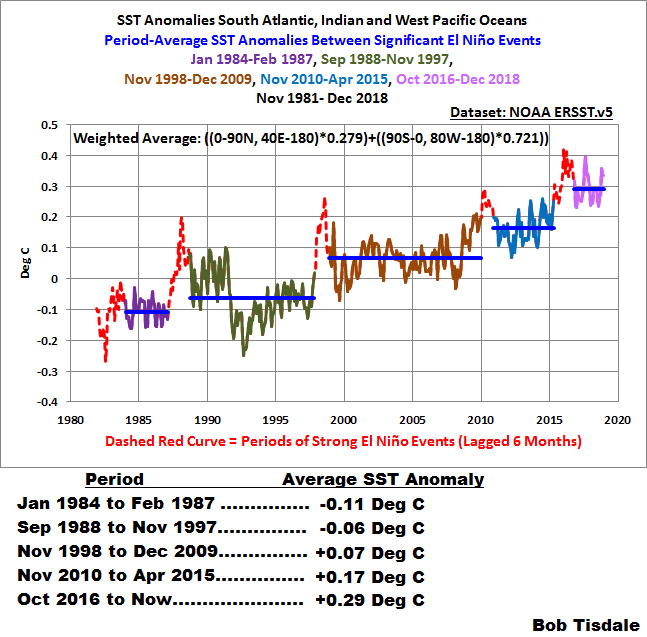 Years later, I began to include El Niño-caused upward shifts for a much large portion of the global oceans in my monthly satellite-era sea surface temperature anomaly updates, which I haven’t updated for more than 2 years. The South Atlantic, Indian, and West Pacific represent about 52% of the surface of the global oceans. The following bold-faced text (in italics) comes from my ebook Dad, Why Are You a Global Warming Denier?. It is part of a conversation between a daughter (Anna) and her Dad, and it’s written in the first person by Anna. 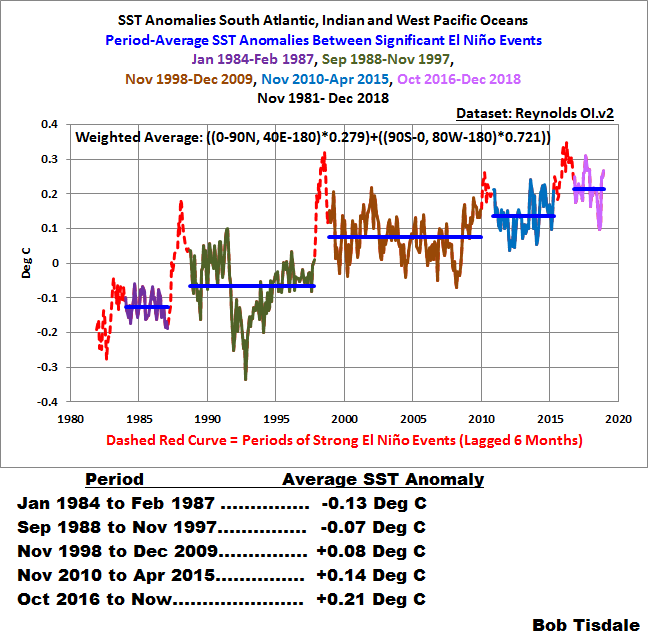 It provides a reasonably easy-to-understand, non-technical (as non-technical as I can get), explanation for the upward steps in the sea surface temperatures of the South Atlantic/Indian/West Pacific Oceans that are caused by strong East Pacific El Niño events. “They are much more than just warming events, and, further, regardless of what the numbskull science reporters say, there’s nothing unusual about them.” Dad shook his head disgustedly. “Magnificent would be a better word. Here are the facts. El Niño events occur every two to seven years. El Niños are the most-amazing, and the most powerful, weather events ever devised by Mother Nature. How powerful? El Niños are often kick-started by series of tropical storms in the western tropical Pacific. “Okay, hold on for a few minutes while I get the globe from your bedroom.” Dad returned with a globe I’ve had sitting on a bookshelf since I was in grade school. He gave it an enthusiastic spin and sat beside me, before placing it on the table between us. He stopped the globe’s spinning and turned it so the Pacific Ocean faced us. From my viewpoint, the Pacific Ocean, with very little land, was all I could see. It was a great reminder of just how massive the Pacific Ocean was. “Indeed. Now, the surface waters in the eastern tropical Pacific are normally cooler than the waters in the western portion. And there’s a simple explanation. The eastern boundary currents along the coasts of North and South America return cool waters from the extratropics to the tropics.” He traced his index finger southward along the west coasts of North and Central Americas then traced it northward along the west coast of South America. “During normal conditions, the trade winds push those cool waters from the eastern tropical Pacific all the way halfway around the globe across the tropical Pacific, under the warm tropical sun, pushing it ever westward until all of that sun-warmed water runs into Indonesia and Australia.” While he said the last sentence, he pretended to push water from east to west all the way across the tropical Pacific, from the west coast of South America at Ecuador, to Indonesia and Australia. “The western boundary currents carry those sunlight-warmed waters toward the poles where those poleward-traveling waters release the sunlight-created heat to the atmosphere.” As he spoke, he continued his demonstration, finger-tracing poleward in the South Pacific, east of Australia, then switching hemispheres and tracing the North Pacific east of Asia. “Yup. Everything about the Pacific Ocean is huge. I groaned, with a smile. “NOAA and Australia’s Bureau of Meteorology (BOM) monitor lots of atmospheric and oceanic variables in the tropical and equatorial Pacific, so you can actually watch the slow birth of an El Niño online as it occurs over many months. After that 1.700-word introduction, the explanations for the upward steps continue for another 3,000 words in Dad, Why Are You A Global Warming Denier?, then move onto a discussion and explanation of the naturally occurring Atlantic Multidecadal Oscillation, which caused the sea surfaces of the North Atlantic in recent decades to warm at a higher rate than the naturally caused warming by strong El Niño events of the South Atlantic, Indian and West Pacific Oceans. Also discussed is how La Niña events replenish the warm water in the West Pacific Warm Pool. The sea surface temperatures in the Eastern Equatorial Pacific are cooler than normal during a La Niña, and because they’re cooler, there is less evaporation taking place, and further, with less evaporation, there is less cloud cover, so sunlight is able to reach into the tropical Pacific and warm it to depth. As a reminder: During normal times the trade-wind driven North and South Equatorial Currents in the tropical Pacific carry waters almost halfway around the globe, and that water warms as it goes halfway around the world under the tropical sun. After that one pass along the tropical Pacific, some of that sunlight-warmed water is stored in a large, deep pool called the West Pacific Warm Pool, without having made a complete circuit of the North or South Pacific gyres where they can more readily release heat to the atmosphere at mid-to-higher latitudes, primarily through evaporation. The volume of warm water in the West Pacific Warm pool increases with time and is often dramatically increased during La Niña events, when a reduction in cloud cover allows sunlight to reach into the tropical Pacific and warm it to depth. With a strong East Pacific El Niño, a huge volume of warm water from the West Pacific Warm Pool is driven eastward to the Eastern Tropical Pacific, as far as the coast of South America, where the surfaces are normally cooler than in the West Pacific Warm Pool. At the end of the El Niño, when the trade winds resume their normal east-to-west operation, all of the warmer-than-normal water in the eastern tropical Pacific—that’s left over from the El Niño—is driven west to be warmed a second time under the tropical sun as it travels halfway around the globe before it then is driven toward the poles so that it can release heat to the atmosphere, primarily through evaporation. Phrased another way, after the El Niño, the surface waters are warmer than normal in the Eastern Tropical Pacific before they begin their trip across the tropical Pacific under the warm tropical sun. There’s no way that a strong East Pacific El Niño cannot contribute to long-term global warming. Does the opposite happen during a La Niña? Here’s the real clincher. At the end of the La Nina, when the trade winds weaken to their normal east-to-west strengths, is all of the cooler-than-normal water in the eastern tropical Pacific—that’s left over from the La Niña—driven west to be cooled a second time under the tropical sun as it travels halfway around the globe before it then is driven toward the poles so that it can absorb heat from the atmosphere? Of course not. Anyone who says a La Niña is the opposite of an El Niño is announcing their ignorance of El Niño and La Niña processes for the world to see—or—they are willfully misrepresenting those processes. A tremendous amount of heat is released from the Tropical Pacific during an El Niño. Where does the ocean heat come from and how is it recharged? Part of that heat loss, or all of it (plus some more on occasion) can be created immediately before the El Niño (as was the case before the 1997/98 Super El Niño during the thought-to-be-weak 1995/96 La Niña) or restored afterwards by the coupled-ocean atmosphere processes that take place in the tropical Pacific during La Niña events, as happened during the 1998/99/00/01 La Niña. (You can confirm the timing and length of those La Niña events with the Oceanic Niño Index here.) Colder-than-normal sea surface temperatures in the tropical Pacific during a La Niña lead to less evaporation than normal there, which results in less cloud cover than normal there, which allows more sunlight (downward shortwave radiation) than normal to enter into the Tropical Pacific thus charging (recharging) the ocean heat. Thus, El Niño and La Niña events act together as a chaotic, naturally occurring, sunlight-fueled, recharge-discharge oscillator, with El Niño events acting as the discharge phase and La Niña events acting as the recharge phase. Simple. And before someone makes some bizarre claim about longwave (infrared) radiation being responsible for the charge/recharge during La Niñas, there’s a problem with that logic. Why? you ask. Because downward longwave radiation increases over the Tropical Pacific during the El Niño phase, when the tropical Pacific is releasing heat, and downward longwave radiation decreases over the Tropical Pacific during the La Niña phase, when the tropical Pacific is charging heat. The recharge aspect of La Niña events was discussed and documented with data in lots more detail in Chapter 3.10 The Recharge of Ocean Heat during the La Niña of my free ebook Who Turned on the Heat? – The Unsuspected Global Warming Culprit, El Niño-Southern Oscillation. The sea surface temperature anomalies of the NINO3.4 region (5S-5N, 170W-120W) of the equatorial Pacific are a commonly used metric for the timing, strength and duration of El Niño and La Niña events. 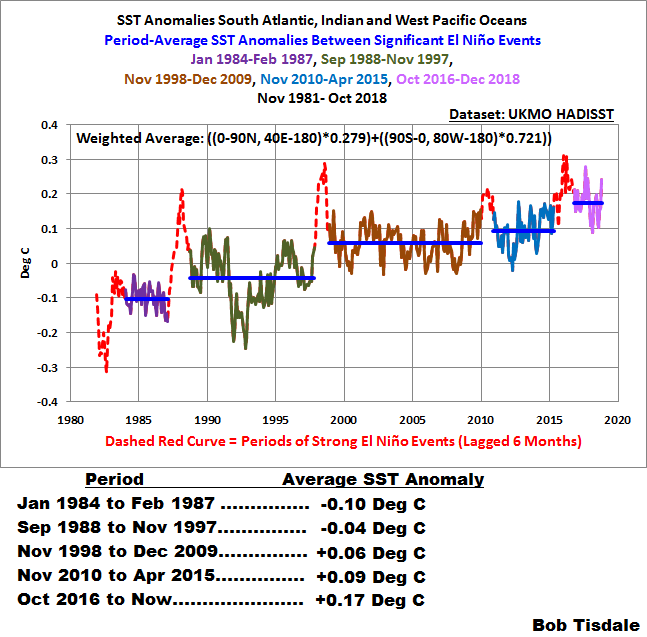 During the satellite era, the trend of the sea surface temperature anomalies for the NINO3.4 region is a flat line, with a trend of -0.004 deg C/decade. See Figure 3. You may have a question like, Why didn’t the longest-and-strongest 2014/15/16 El Niño create more of an upward step in the sea surface temperatures of the South Atlantic, Indian and West Pacific (Figure 1)? We’ll investigate that and present the findings in an upcoming post. And I don’t believe you’ll be surprised. Have fun in the comments and enjoy the rest of your day. 13 Responses to Does The Climate-Science Industry Purposely Ignore A Simple Aspect of Strong El Niño Events That Causes Long-Term Global Warming? That was great again, Bob. Thank you so much. Your postings and books (I have them all) give us a fundamental insight into those processes which make the climate. I’m happy that you are back again! Thank you, Werner. It’s good to be back talking ENSO again. Thank you very much for buy the books. I repeat every word Werner said! I’ll read more comments over at WUWT, Bob. Thanks again! Bob how is Dr Spencer’s idea about the changes in the PDO and clouds holding up since this post in 2008? He showed that this could provide about three quarters of the answer to observed changes in temperature from 1900 to 2000. Could a small change in cloudiness be an important factor and just a natural change in climate? ngard2016, those are questions for Roy Spencer, not for me. Bob, a comment you made warrants a deeper analysis, “the aerosols emitted by the 1991 eruption of Mount Pinatubo overwhelmed any aftereffects from the 1991/92 El Niño..” The aerosols of the Gulf war also contributed to suppression of the 1991/1992 El Niño. If we have data to look backwards in time, during or before the peak temperature episodes of the 1930’s, and the subsequent suppression of El Niño events from aerosol emissions from WW2 and post WW2 industrial aerosols, we may find repeated evidence of dimming compounds working on the chaotic but natural El Niño double boiler warming. We may be naturally warming in El Niño steps, with suppressed El Niño events dominating much of the past few centuries, creating the illusion of unnatural warming. As always, your heat transfer approach to analysis raises more questions to explore. Ed, do you know of a source of realistic aerosols data we could work with? do you plan to release temperature updates like this in future again? Werner, you may have just talked me into it. There is a geography of climate change and climate dynamics. And you represent it in a nice way, Bob. The complexity can be overwhelming, and it is hard to understand. And I see that he really got his enemies among the Realclimate crew. : “Gray and Muddy Thinking about Global Warming” Contributors Gavin Schmidt, Michael Mann, Ray Pierrehumbert, Stefan Rahmstorf (presentation of the right thoughts from gavin, stefan, raypierre and mike). I don`t know how many of Gray`s ideas are right, But it seems like a deep understanding of climate.